St. Francis de Sales said, that while many saints should be imitated, some of the saints are to be admired more than imitated. The life of St. Francis gives us some of both. On the one hand, his extraordinary love of God, his humility, his penance, his charity, his prudence and his detachment from and loathing for the world, are all virtues that every Christian should seek to emulate throughout his life. On the other hand, his discernment of spirits, his miracles, his extraordinary fasting and mortification of his body, his ecstasies and the stigmata are all things God performed in St. Francis for our wonderment, to give glory to Him for what He brought about in his servant. We have provided a spiritual classic, Fr. Candide Challipe's Life of St. Francis, translated by the Oratorians of London into English. The value of Challipe's narrative, having compiled all of the sources available at the time of his writing (1700's) is that he balances the narrative between the two different elements which made Francis one of the greatest saints in the history of the Church. Challipe's work is not only a spiritual tour de force, but is also a great work of theology, as he unfolds the life of St. Francis with respect to the subsequent theology of the Church through St. Bonaventure, St. Thomas, The Council of Trent and St. Robert Bellarmine. He quotes frequently not only from the Franciscan sources, but also from the Holy Scripture, the Fathers, and the great Theologians of the Middle Ages and the early modern period. The important feature of the Mediatrix press edition, freshly scanned and OCRed from the 1877 American Edition, is that we have retained all of the footnotes, and faithfully reproduced the Oratorian translation without any abridgement, only removing notes of mere technicalities and updating certain jarring old English spellings. We have also added several of the frescoes of Giotto, which are found in the Basilica of St. Francis in Assisi, to elucidate and illustrate the work. Giotto is often credited with beginning the Renaissance, and in some ways he did, though he can scarcely be identified with the humanist goals of Petrarch, or the classicism of Michaelangelo or Raphael. Giotto is firmly within the Byzantine tradition of Iconography, but as he progressed in his career added elements of perspective and three dimensional painting, while presenting an essentially iconographic depiction of the life of St. Francis. The Frescoes reproduced here, are filled with theological depth which bring out in pictures (in an age prior to the printing press when literacy was not accessible to the masses due to technological limitations) the spiritual depth of the events in St. Francis' momentous life. In fine, Francis is a simulacrum of Christ Himself, and many of the events of his life were brought about by providence, in order to to conform the life of the Saint to his own. His, is an epoch, placed in a time of great emperors, sultans, and Popes such as Innocent III, one of the most able Popes in history. His, is the age of St. Dominic, the Crusades, the Reconquista, and a great period of reform in the life of the Church, as well as a well-spring for subsequent renewal in the 16th and 17th centuries. The life of Francis also is a model of reform in our age, when the crisis in the Church is not only of the secular state on the outside, but the corruption on the inside, which can only be renewed by the qualities which allowed Francis to perform miracles and be elevated by Christ in the way he was, true faith, penance, reverence for the Mass and the Eucharist, and divine apostolic charity. May this work be a benefit to everyone in the Church, that they will seek to be one with Christ as completely as St. Francis. 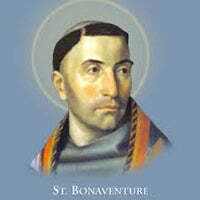 St. Bonaventure was an Italian medieval Franciscan, scholastic theologian and philosopher. The seventh Minister General of the Order of Friars Minor, he was also Cardinal Bishop of Albano. He was canonised on 14 April 1482 by Pope Sixtus IV and declared a Doctor of the Church in 1588 by Pope Sixtus V.